These women lived out one particular aspect of the command to love God with heart, mind, and soul and neighbor as self. Therese Martin was born in Alencon France in 1873, the youngest of nine children. Her father, Louis, was a successful watchmaker and jeweler. Her mother Zelie Guerin, built a cottage industry in lace making, beginning in the village of Alencon, which is known for its delicate lace. Four of Therese's siblings died at a young age; the remaining five girls eventually all entered the convent, so deep was their call to sanctity. Four became contemplative Carmelite Nuns at the Lisieux Carmel, and one became a Visitation sister. Therese wasn't always a nun nor was she always a saint. She was a very regular little girl, who was rather sensitive. In fact, she seemed like a spoiled little girl, who would stomp her feet and have a temper tantrum if she did not get her own way. After the death of her mother, while Therese was only 4, her father, who referred to her as "my little queen" would give her anything she wanted to keep her happy. Louis Martin was protective of his daughters. He wouldn't allow them to read the newspapers, fearful that it would make them too worldly. But the mischievous girls would steal away with the newspaper while papa napped and carefully return it before he awoke. At a young age, this precocious child wanted everything. She would get more than she bargained for. Sick physically and emotionally, she was healed by Our Lady of the Smile at the age of 11. She experienced a profound conversion on Christmas eve, 1886, at the age of 13. She felt a call to enter Carmel as a contemplative Nun, so that she could give herself totally to Jesus. But she was too young. Appeals to the Mother Superior and Priest Chaplain yielded: "when you are old enough -16". Not content, Therese and her father appealed to the Bishop. Not getting the response she wanted, she appealed directly and personally to the Pope while on a parish pilgrimage to Rome. Therese had always said: "I want everything" - and she usually got it. Persistence paid off. 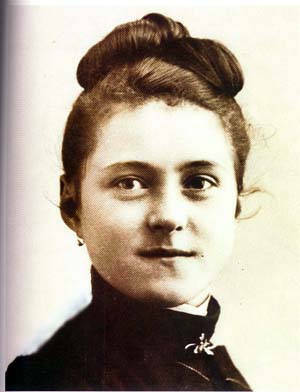 Therese was allowed to enter the Lisieux Carmel at the age of 15 - her father lived to see her professed a Carmelite Nun. She took the religious name of Sister Therese of the Child Jesus and the Holy Face. God's spirit worked powerfully in Therese, so open was she to Divine Love. Still dreaming of taking on the world as a priest and missionary, she wrestled with her vocation and place in the Church. Finally she came to realize that her "vocation is love" - the love of God was the energy source for the Church - and fulfillment of the human heart and longing. Despite her desire for the dramatic and expansive, Therese developed a simple spirituality, based on childlike trust and confidence in God. The spirituality of her "little way" was not about extraordinary things - but rather about doing simple things of life well and with extraordinary love. She believed and taught that "everything is grace" - God's face and presence could be experienced in every person and situation of our lives, if we just attend with love and expectancy. Her struggle, like ours, is to be where God places us in the real life situations of our lives. Therese's is a hands-on, challenging and focused spirituality. This is what made Therese shine, and why she has been declared a Doctor of the Church. Her spirituality is simple, childlike, profound and human - it is refreshing in our confusing and complicated age. Experiencing the dark night of the senses and spirit refined the power and energy of this young, precocious Carmelite. Her poems and plays reflect her struggle to give all to God. Her love became surrender, as she slowly died of tuberculosis. Her superior asked her to write down her reflections, which became her autobiography, "Story of a Soul." She died at the age of 24, believing that her life was really just beginning for God, promising to spend her heaven doing good on earth. Her promised "shower of roses" began and have become a torrent in the Church ever since. Born in Avila of well-to-do parents in 1515, St. Teresa was attracted to the religious life for a long time. In 1535, she entered the Carmelite Convent of the Incarnation, which was nearby. After her profession, however, she fell terribly ill and had to be absent from the community for three years as she struggled with fainting spells, paralysis and other perplexing health problems. Teresa also had difficulties with prayer. At times she saw visions and heard voices. Some confessors and spiritual advisors said these things were from God, while others said that they were the work of the devil. She found special comfort, however, in spiritual advisors like St. Peter of Alcantara and others who assured her that her experiences were from God. It’s helpful to know what life was like in the Carmelite convents in Teresa’s day. The lifestyles of many nuns had become lax. Visitors could come rather freely as guests of the nuns, and the nuns, many who had comes from wealthy families, could have servants living in the convent with them or could live away from the convent if they wished. Teresa’s own life had become somewhat comfortable. She had her own oratory (chapel), kitchen and guest room, according to Butler’s Lives of the Saints. For some time, Teresa believed that reforms were needed in the Carmelite way of life. She and others felt the convents at the time were too large. Some numbered over 100 members and were often considered too open to worldly distractions. At times, Teresa longed for a poorer form of life in a smaller community (limited to about a dozen nuns) that would adhere to the original Rule and spirit of the Carmelites. In fact, Teresa became strongly convinced that God was calling her to bring about reform among the Carmelites. It was about this same time (1567) that Teresa met a newly ordained Carmelite priest, St. John of the Cross, while establishing her second reformed convent at Medina del Campo. Teresa was 52; John of the Cross was 25. She convinced him to collaborate with her in the reform of the Order. Within a year, she founded her first monastery for men at Duruelo, not far from Avila. A few years later, when Teresa was appointed abbess of the Convent of the Incarnation in Avila, she obtained permission for John of the Cross to become the confessor for the convent. Some of the Carmelite friars questioned the way Teresa arranged his appointment. There were other signs that strong resistance to the reform movement was growing. They would soon discover that trying to reform an established Order is not the best way to win a popularity contest. The spiritual controversy reached a climax in 1577, when Carmelite friars, opposed to reform, took John of the Cross by force and imprisoned him for nine months in the Carmelite priory in Toledo in a 6 x 10-foot cell. During these years, Teresa was often traveling about Spain seeking to implement her reforms under difficult circumstances and in the face of angry opposition at times. Increasingly, she would be suffering from ill health as well. In the beginning, Teresa found difficulties with prayer and was discouraged by long periods of spiritual aridity, but over the years she made great progress in her prayer life, giving all the credit to God. In her Autobiography, Teresa describes a special moment of profound spiritual conversion that she experienced while praying before an image of the wounded Christ. “When I fell to prayer again,” she wrote, “and looked at Christ hanging poor and naked upon the Cross, I felt I could not bear to be rich. So I besought him with tears to bring it to pass that I might be as poor as he.” Teresa’s experience reminds us of St. Francis of Assisi and also gives us a sound, spiritual reason, based on the example of Christ, why Teresa saw a stricter form of poverty as an important goal in her reformed monasteries. Meanwhile, deep within herself, Teresa was also becoming vividly aware of God’s presence. In 1572, while receiving Communion from the hands of John of the Cross, she received the favor of spiritual marriage or mystical union with God. She had already been experiencing visions of Christ and of the saints and was often drawn into states of ecstasy. She constantly attributed such favors to the goodness and mercy of God and not to any virtue on her part. Teresa of Avila’s greatness as a spiritual writer was not universally recognized during her life. It would take a few centuries before her contributions to mystical theology and Christian spirituality were duly recognized. This finally came about in 1970, when Pope Paul VI declared Teresa a Doctor of the Church, the first woman to be so honored. A brilliant philosopher who stopped believing in God when she was 14, Edith Stein was so captivated by reading the autobiography of Teresa of Avila (October 15) that she began a spiritual journey that led to her Baptism in 1922. Twelve years later she imitated Teresa by becoming a Carmelite, taking the name Teresa Benedicta of the Cross.Born into a prominent Jewish family in Breslau (now Wroclaw, Poland), Edith abandoned Judaism in her teens. As a student at the University of Göttingen, she became fascinated by phenomenology, an approach to philosophy. Excelling as a protégé of Edmund Husserl, one of the leading phenomenologists, Edith earned a doctorate in philosophy in 1916. She continued as a university teacher until 1922 when she moved to a Dominican school in Speyer; her appointment as lecturer at the Educational Institute of Munich ended under pressure from the Nazis. Pope John Paul II beatified Teresa Benedicta in 1987 and canonized her 12 years later. Mother Teresa was always her own person, startlingly independent, obedient, yet challenging some preconceived notions and expectations. Her own life story includes many illustrations of her willingness to listen to and follow her own conscience, even when it seemed to contradict what was expected. This strong and independent woman was born Gonxha (Agnes) Bojaxhiu in Skopje, Yugoslavia, on August 27, 1910. Five children were born to Nikola and Dronda Bojaxhiu, yet only three survived. Gonxha was the youngest, with an older sister, Aga, and brother, Lazar. This brother describes the family's early years as "well-off," not the life of peasants reported inaccurately by some. "We lacked for nothing." In fact, the family lived in one of the two houses they owned. Nikola was a contractor, working with a partner in a successful construction business. He was also heavily involved in the politics of the day. Lazar tells of his father's rather sudden and shocking death, which may have been due to poisoning because of his political involvement. With this event, life changed overnight as their mother assumed total responsibility for the family, Aga, only 14, Lazar, 9, and Gonxha, 7. Though so much of her young life was centered in the Church, Mother Teresa later revealed that until she reached 18, she had never thought of being a nun. During her early years, however, she was fascinated with stories of missionary life and service. She could locate any number of missions on the map, and tell others of the service being given in each place. At 18, Gonxha decided to follow the path that seems to have been unconsciously unfolding throughout her life. She chose the Loreto Sisters of Dublin, missionaries and educators founded in the 17th century to educate young girls. In 1928, the future Mother Teresa began her religious life in Ireland, far from her family and the life she'd known, never seeing her mother again in this life, speaking a language few understood. During this period a sister novice remembered her as "very small, quiet and shy," and another member of the congregation described her as "ordinary." Mother Teresa herself, even with the later decision to begin her own community of religious, continued to value her beginnings with the Loreto sisters and to maintain close ties. Unwavering commitment and self-discipline, always a part of her life and reinforced in her association with the Loreto sisters, seemed to stay with her throughout her life. One year later, in 1929, Gonxha was sent to Darjeeling to the novitiate of the Sisters of Loreto. In 1931, she made her first vows there, choosing the name of Teresa, honoring both saints of the same name, Teresa of Avila and Therese of Lisieux. In keeping with the usual procedures of the congregation and her deepest desires, it was time for the new Sister Teresa to begin her years of service to God's people. She was sent to St. Mary's, a high school for girls in a district of Calcutta. Here she began a career teaching history and geography, which she reportedly did with dedication and enjoyment for the next 15 years. It was in the protected environment of this school for the daughters of the wealthy that Teresa's new "vocation" developed and grew. This was the clear message, the invitation to her "second calling," that Teresa heard on that fateful day in 1946 when she traveled to Darjeeling for retreat. During the next two years, Teresa pursued every avenue to follow what she "never doubted" was the direction God was pointing her. She was "to give up even Loreto where I was very happy and to go out in the streets. I heard the call to give up all and follow Christ into the slums to serve him among the poorest of the poor." Technicalities and practicalities abounded. She had to be released formally, not from her perpetual vows, but from living within the convents of the Sisters of Loreto. She had to confront the Church's resistance to forming new religious communities, and receive permission from the Archbishop of Calcutta to serve the poor openly on the streets. She had to figure out how to live and work on the streets, without the safety and comfort of the convent. As for clothing, Teresa decided she would set aside the habit she had worn during her years as a Loreto sister and wear the ordinary dress of an Indian woman: a plain white sari and sandals. Teresa first went to Patna for a few months to prepare for her future work by taking a nursing course. In 1948 she received permission from Pius XII to leave her community and live as an independent nun. So back to Calcutta she went and found a small hovel to rent to begin her new undertaking. Wisely, she thought to start by teaching the children of the slums, an endeavor she knew well. Though she had no proper equipment, she made use of what was available—writing in the dirt. She strove to make the children of the poor literate, to teach them basic hygiene. As they grew to know her, she gradually began visiting the poor and ill in their families and others all crowded together in the surrounding squalid shacks, inquiring about their needs. Teresa found a never-ending stream of human needs in the poor she met, and frequently was exhausted. Despite the weariness of her days she never omitted her prayer, finding it the source of support, strength and blessing for all her ministry. Teresa was not alone for long. Within a year, she found more help than she anticipated. Many seemed to have been waiting for her example to open their own floodgates of charity and compassion. Young women came to volunteer their services and later became the core of her Missionaries of Charity. Others offered food, clothing, the use of buildings, medical supplies and money. As support and assistance mushroomed, more and more services became possible to huge numbers of suffering people. From their birth in Calcutta, nourished by the faith, compassion and commitment of Mother Teresa, the Missionaries of Charity have grown like the mustard seed of the Scriptures. New vocations continue to come from all parts of the world, serving those in great need wherever they are found. Homes for the dying, refuges for the care and teaching of orphans and abandoned children, treatment centers and hospitals for those suffering from leprosy, centers and refuges for alcoholics, the aged and street people—the list is endless. Until her death in 1997, Mother Teresa continued her work among the poorest of the poor, depending on God for all of her needs. Honors too numerous to mention had come her way throughout the years, as the world stood astounded by her care for those usually deemed of little value. In her own eyes she was "God's pencil—a tiny bit of pencil with which he writes what he likes." Despite years of strenuous physical, emotional and spiritual work, Mother Teresa seemed unstoppable. Though frail and bent, with numerous ailments, she always returned to her work, to those who received her compassionate care for more than 50 years. Only months before her death, when she became too weak to manage the administrative work, she relinquished the position of head of her Missionaries of Charity. She knew the work would go on. Finally, on September 5, 1997, after finishing her dinner and prayers, her weakened heart gave her back to the God who was the very center of her life. Our God is certainly full of Grace. Hope you'll look my blog over and follow as I am on yours.